Not long after settlers arrived in what is now the United States and began growing corn and small grain they began to see colorful snakes hanging around their granaries. The snakes normally made their appearance during daylight hours, typically dining on vermin that fed on grain stores. While a bit leery of snakes generally, farmers soon realized that the snakes were not poisonous and that they were in fact valuable in controlling the populations of mice and rats. These early settlers gave the snakes a solid American name: Corn Snakes. And since those times, the snakes have also become popular as pets, proving to be calm of temperament, easy to care for, attractively colored and varied in appearance, and tolerant of handling by their owners. 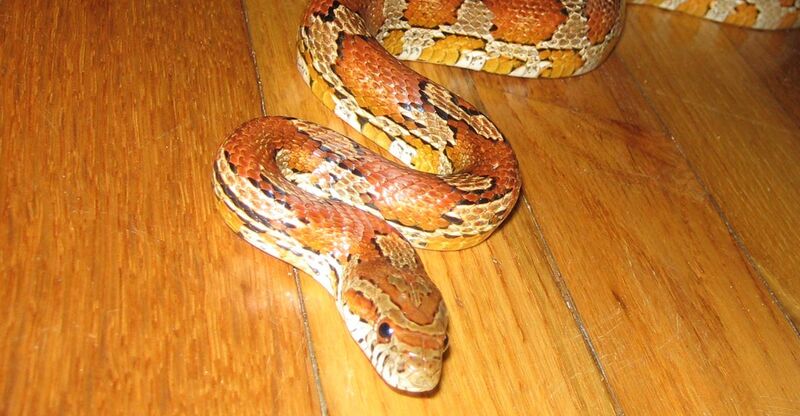 As they have become popular as pets, breeders have introduced wide variations in colors and patterns as well as hybridized them with other varieties of harmless snakes. Corn snakes can grow to a length of six feet and in the wild, they normally live for up to eight years. As pets they can reach 20 years of age or more. In the wild, the snakes are most abundant in the eastern and southeastern United States, where they are sometimes killed, mistaken for poisonous copperheads. Corn snakes hunt during the day and besides visiting granaries, they climb trees in search of small birds and bird eggs; hunt for mice and rats in abandoned buildings; and forage in woodlands, grasslands, and open fields as well as in underground burrows in search of other small rodents. Corn snakes bromate prior to breeding – reposing for 60-90 days in a 50-60-degree temperature where they can’t be disturbed, and waking to breed as temperatures warm. Once her eggs are fertilized, the female snake begins supplying them with nutrients and secretes a leathery shell for each one. About a month after fertilization, the female snake deposits the eggs in a warm, moist, inconspicuous location. After about 10 weeks, five inch-long baby snakes slice their way out of the shell. Mom, of course, is long-gone so the babies immediately begin fending for themselves -- unless they’re in the custody of a kindly herpetologist. Go back to the main Snake Removal page for more information about Corn Snakes: Farmers’ Friends; Popular Pets.